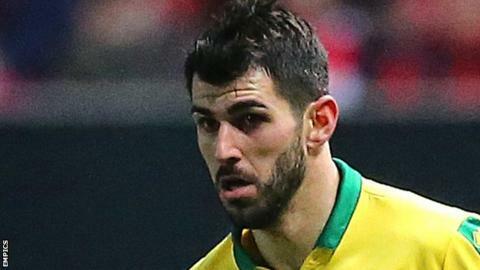 Wolves had victory snatched from them with the last kick of the game at Molineux as Nelson Oliveira's long-range right-foot shot earned Norwich City a dramatic point. The hosts led 2-0 inside 25 minutes thanks to a Jamal Lewis own goal and an Alfred N'Diaye header. Christoph Zimmermann's 27th-minute header set up a tense second half. And, when Wolves looked to have seen it through, substitute Oliveira let fly from 35 yards and it sneaked in. That cut Wolves' lead over second-placed Cardiff to nine points, but they still have a 13-point advantage over third-placed Aston Villa. To add to the home frustration, Wolves have now lost key playmaker Ruben Neves to a two-game ban after picking up his 10th booking of the campaign. It was the second time in four days that the Canaries had popped up with a point-saving last minute equaliser, after their derby draw with Ipswich on Sunday. It was a fun-packed first 27 minutes as Wolves, unchanged for the fifth successive game, took a two goal lead only to have it halved by the break. Wolves led on 14 minutes when Neves and Jota cleverly opened up the Norwich defence, before goal line technology adjudged that the ball had crossed the line off visiting midfielder Lewis. N'Diaye's header from another superb in-swinging Barry Douglas corner doubled the lead - the left back's 10th assist of the season, matching team-mate Ivan Cavaleiro as the Championship's best. But, within two minutes, Zimmermann had headed in James Maddison's free kick. Wolves had chances after the break, without looking at their most fluent. Cavaleiro was just wide after Matt Doherty's gallop down the right, then Wolves seemed sure to score when Helder Costa got clear after Zimmerman's slip, but the covering Mario Vrancic defied a handball shout to somehow clear. With only a one-goal cushion, Wolves were always vulnerable against a more than useful Canaries outfit - and the men in purple contrived an imperial finish. Wolves looked to have escaped when, in injury time, the artful Maddison cut in and had his shot blocked. But, with a desperate final play of the match, Oliveira tried his luck and his dipping right-foot shot crept in at ex-Norwich keeper John Ruddy's left corner. Ruddy, who has kept a Championship best 17 clean sheets this season, including against his former side at Carrow Road earlier this season, looked dejected although the ball did rear up awkwardly a yard in front of him. "It feels like a punch. It goes in, then there's the final whistle. There's no time left and you've lost what you had. "But football is like that. You have to be relentless and maintain your focus. John Ruddy has made so many saves and earned us so many points this season. We are not about individuals. We are a team. "It was a set piece that got them back in the game, which disappoints us, but we had chances to kill the game and did not take them." "It's a good point. I'm proud of my lads. We deserved to come back. "We dominated lots of the game. It was a late equaliser but a deserved one. "We control games and look to exhaust opponents. That helps us to score late goals." Match ends, Wolverhampton Wanderers 2, Norwich City 2. Second Half ends, Wolverhampton Wanderers 2, Norwich City 2. Goal! Wolverhampton Wanderers 2, Norwich City 2. Nélson Oliveira (Norwich City) right footed shot from outside the box to the top right corner. Assisted by Harrison Reed. Corner, Norwich City. Conceded by Willy Boly. Attempt saved. James Maddison (Norwich City) right footed shot from the left side of the box is saved in the bottom left corner. Assisted by Nélson Oliveira. Corner, Norwich City. Conceded by Ryan Bennett. Attempt missed. James Maddison (Norwich City) left footed shot from outside the box is high and wide to the left. Assisted by Harrison Reed. Attempt blocked. Diogo Jota (Wolverhampton Wanderers) right footed shot from the centre of the box is blocked. Assisted by Morgan Gibbs-White. Attempt saved. Jamal Lewis (Norwich City) header from the centre of the box is saved in the top left corner. Assisted by Josh Murphy with a cross. Moritz Leitner (Norwich City) wins a free kick in the attacking half. Timm Klose (Norwich City) wins a free kick in the attacking half. Timm Klose (Norwich City) wins a free kick on the left wing. Substitution, Norwich City. Onel Hernández replaces Mario Vrancic. Substitution, Norwich City. Josh Murphy replaces Marley Watkins. Attempt saved. Morgan Gibbs-White (Wolverhampton Wanderers) right footed shot from the centre of the box is saved in the centre of the goal. Foul by Marley Watkins (Norwich City). Conor Coady (Wolverhampton Wanderers) wins a free kick in the attacking half. James Maddison (Norwich City) wins a free kick in the attacking half. Offside, Wolverhampton Wanderers. Romain Saiss tries a through ball, but Benik Afobe is caught offside. Nélson Oliveira (Norwich City) wins a free kick in the defensive half. Substitution, Norwich City. Nélson Oliveira replaces Dennis Srbeny. Corner, Norwich City. Conceded by Rúben Neves. Attempt saved. Marley Watkins (Norwich City) left footed shot from the centre of the box is saved in the centre of the goal. Assisted by Dennis Srbeny.